New member, and pretty new to the world of grilling/smoking. My name is Jon, and I'm down in Victoria. My father in-law bought me a starter grill this past Christmas, so I've only had less than a year's worth of experience. 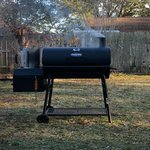 I'm using as Kingsford Sierra Smoker - and up until this past week I only grilled on it, and hadn't smoked, I'd been intimidated to try out the smoker part of it. I'm pretty confident with my chicken leg quarters, burgers, beef fajitas, and beef ribs ... this past weekend I attempted my first brisket. Kept it simple by only seasoning with salt, pepper, and Montreal steak seasoning. Smoked it at 250 until internal temp reach around 150, then wrapped it and put it in the oven until internal temp was around 200-205. These was all under the direction of my father in-law, when he came to visit for a couple days. I'm thinking of changing the method a bit, as I'd like to keep it in the smoker longer, and probably not trim as much fat off as he instructed - it was a tad dry. However, I've been searching smoker tips the last few days because I can't wait to smoke another one! Came across this forum from google, and figured what better place to learn and sharpen my skills. Looking forward to learning from y'all! Welcome! There's plenty to learn from the folks here. You chose a great place. Howdy and Welcome, Jon, you won't have any problem getting Brisket tips and advice here - - - there's hardly a day go by that someone isn't posting a Brisket Cook. Victoria, brings back many good memories for me. My Grandfather was Station Supt at TBT Compressor Station down by Bloomington and I spent many Summer's with he and Granny there. You can learn a lot on here. I know I owe a lot to the guys on here as they have helped me elevate my cooking for sure. Welcome my brother of bbq! lol all i can say is practice makes perfect And knowing how to use your tool of the trade, your pit of choice, is paramount.